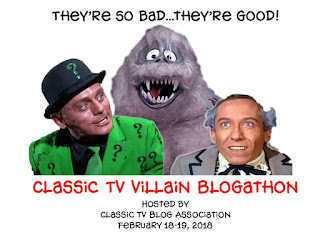 Classic TV Blog Association: Classic TV Villain Blogathon! Classic TV villains...they're so bad, they're good! On February 18-19, the Classic TV Blog Association will pay tribute to some of television's best baddies by hosting the Classic TV Villain Blogathon. It will feature killer robots, beautiful bad girls, a crooked sheriff, Bigfoot, an obsessed cop, a cowardly scoundrel, a clever con man, and much more! So join us over the next two days as we show some love to many of classic television's most memorable villains! I tend to think that I've spent way too many hours of my life watching TV. Yet, it never fails that this group focuses on shows I've never seen. It's one of the reasons I love when the CTVBA schedules blogathons. Thanks everybody!